Before I started gushing about Beyond the Wall my best buy of 2013 was Hollowpoint. But now it’s 2015 and honestly, I haven’t been playing it nearly enough. 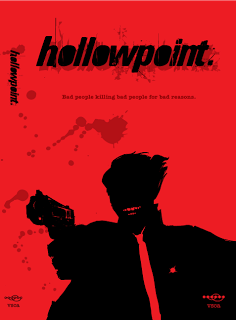 So, while trying to draw up a last-minute scenario for Concrete Cow I started thinking about what makes Hollowpoint work. These are my thoughts in no particular order. likes to work alone, and hates to have to ask for help. What this means is when you have a mission, each and every character should feel they would be able to do the mission solo, if they had the right resources. Of course they don’t, because the mission is just a bit more than any one character can handle. But even though they’re painfully aware that they need to work with others to get the job done, they don’t like it. In other words each character should have a strong opinion on how the mission gets done. And more to the point, when it comes to players declaring which skill gets used in a conflict, that’s an open declaration of this is my plan and it’s the best plan. At this stage players should not be negotiating on how to tackle the mission together. Asking for help comes later, and has its own mechanics to make the PCs feel uncomfortable. But in order for each player to have a very clear view of what their character thinks is the right thing to do, they must have a clear view of the mission objective. At this point it’s OK for the characters to negotiate and argue about where they are collectively going to go; those discussions will help focus on the objective. But if the objective is ambiguous, that’s a problem because this isn’t an investigation game of gathering clues, it’s a game of taking action and overcoming obstacles. Of course you can run investigations using the Hollowpoint rules, but that just makes the objective “get this piece of information” and whatever skills the players feel are right get applied to getting that information — stealing, conning, killing, intimidating, seducing. So yeah, the operative word in the strapline isn’t bad, because you don’t need the PCs to be bad. It isn’t even killing, because you can use this system with no KILL skill. No, the operative word is reasons. Reasons and objectives drive the character forward.